Welcome to Shri Krishna GiftsManufacturer & Supplier of Candles, Incense Sticks and Decorative DiyasThe company was incepted in 2006. Ethical business policies & convenient paymentoptions help us to cater East Europe & Central America. Customized solutions, Stunning look & appealing designs make us the preferredsupplier in the industry. We offer a wide array of Candle Holders, Dry Flowers & Decorative Diyas. Our Designer & Decorative Candles are best in the industry amongst others. Colourful & Perfume Candles offered by us are in huge demand across the globalmarkets. 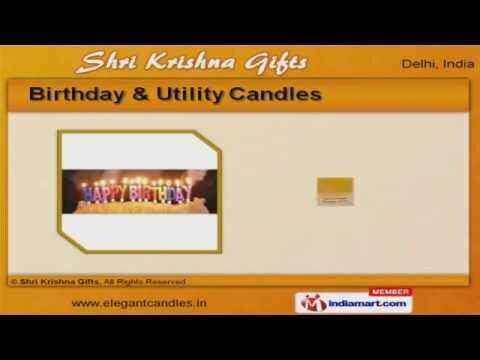 Our Birthday & Utility Candles are nothing but the best solution for all your needs. We also provide Candle Holders & Incense Sticks that are some of our best sellingproducts. Along with that we offer Dry Flowers & Decorative Diyas that are available at affordableprices.